Sticking To My New Year’s Resolution – My Skincare Discoveries.. Historically and in all honesty, my skin has never been amazing, and I’m sure I’m preaching to the choir in regards to skincare anyway. I’d always put my awful skin – read spotty, oily, uneven mess of a face – down to teenage hormones and puberty, before I realised that I’ve never been ‘the best’ at sticking to a skincare routine long enough for it to actually make any difference. Note to self – a face mask once every three weeks does not constitute a routine and will not fix all of your skincare woes, but my lesson has now well and truly been learnt. At the beginning of the year, I made it my New Year’s Resolution to create a skincare routine and ensure I implemented it every night, and along the way, I’ve discovered some great products that have made my skincare struggles almost nonexistent.. While my knowledge of skincare and my habits have both drastically improved, face masks still remain a staple in my skincare routine – not only do they improve your skin, but I genuinely believe there’s no better way of winding down after a long day than sitting for a few minutes with a face mask on, listening to some music and blocking out the world – self care at it’s finest. A few new recent additions to my collection have been the Derma V10 Clay Mask Collection, kindly sent to me by their team, with my personal favourite being the Detoxifying Mask. 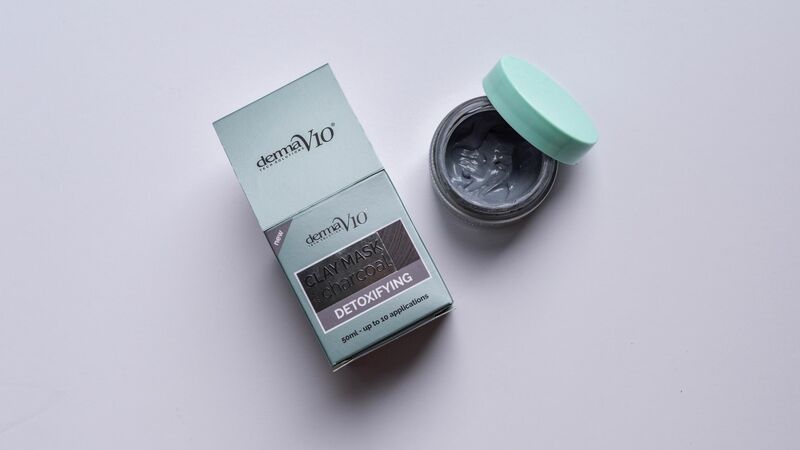 Charcoal is my go-to face mask ingredient as it aids in removing excess oil – and boy, there’s a lot of excess oil in my skin generally, not helped in any way by the warmer weather we’re having at the moment. If you’ve ever used the L’Oreal Pure Clay Face Masks, I found these to be super similar in packaging, use and texture, although a little thinner in consistency, leaving the skin smooth, matte and cooled – the perfect combination after the long, sweaty days we’ve been having recently. Each pot contains around ten masks and they’re available for £1.99, which is an incredible price point for the product itself, in my opinion, meaning I can use them as often as I like without feeling guilty about spending an excessive amount on face masks every month. It’s not an addiction, it’s only a habit, I promise..
As anyone with blemished skin will know, tea tree oil is a must-have in your skincare routine, and it always tends to work really well for me and my face – the chemicals in it help to kill bacteria and reduce allergic reactions, making it perfect for oily skin that’s prone to blemishes, which is how I’m best described. I have an association in my head between tea tree oil and teenage acne treatments, and while the smell will never be my favourite, I notice a difference in my skin within hours of using products that contain the ingredient. A recent favourite of mine has been the Tea Tree Skin Clearing Mattifying Toner by The Body Shop. My perfect skincare product would be skin clearing, mattifying and easy to use – so basically, everything this product is about. I fell in love with it so quickly that I still believe it’s been sent from another planet, I can’t imagine life without it and I already plan on repurchasing, even though I’m only halfway through the bottle. Can you tell I’m obsessed yet?! I use this after cleansing to ensure that all traces of my makeup are removed, and it leaves my skin feeling fresh, with a ‘tightness’ that I actually enjoy. Minus a few, tiny blemishes along my jawline, which is where I’m most prone to breakouts, my skin has been entirely clear ever since I started using this daily – *touches wood and prays I haven’t just jinxed myself*..
Two of the most recent additions to my skincare routine were kindly sent over to me from the team at Dermalogica. While their products had always been raved about and recommended, I was a little nervous about purchasing, knowing just how inconsistent I am with my skincare, thinking that I would splurge and they’d just sit at the back of my vanity, unused. However, I can’t wait to get my hands on more of their products and have a full wishlist of items I want to try. 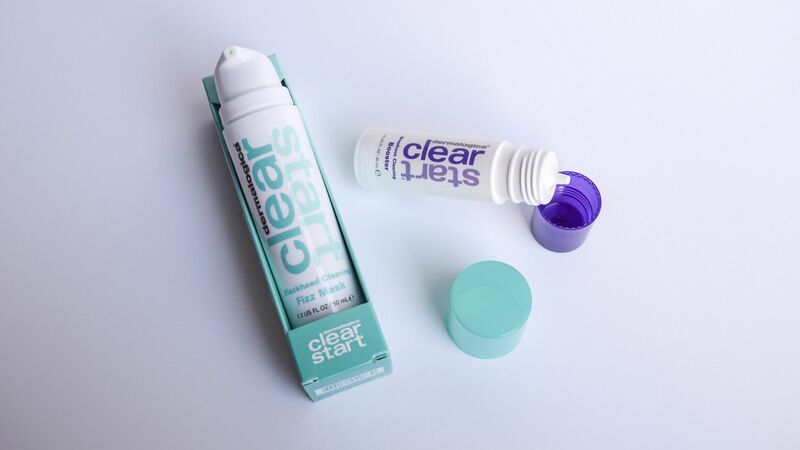 The Breakout Clearing Booster is super easy to use, I really like the smell which is almost unheard of for me and skincare products, and I love the little nozzle, which makes it super easy to apply directly to any spots or breakouts. Alongside that, the effects of their Blackhead Clearing Fizz Mask were noticeable from the first use – and if you’ve never used a bubble mask before, you need to because the feeling is indescribably crazy – meaning that both products have become staples in my routine ever since they first arrived..
I’ve learnt a lot on my skincare journey so far – from researching and reading reviews, to find out about what products and ingredients work best for me – but one item that will never leave my vanity, one that I swear by and will slather on if I need, is Sudocrem. A controversial skincare product, but a winner nonetheless for me, this is always my last resort – if all else fails, I’m safe in the knowledge that this will save me from whatever decides to call my face it’s home, without a doubt. Here’s to good health, clear skin, and for us oily gals, slightly cooler temperatures to save our faces from constantly melting off..
What skincare products have you been loving recently? What’s the one product that never leaves your vanity? "New In – My Most Recent (And Some High-End) Makeup Purchases.."